A judge has ruled that a Cumbria wind farm is not a noise nuisance. Three couples began legal action against the owners and operators of the Far Old Park Farm turbines. They argued the complex of seven turbines caused a noise nuisance. But on Tuesday a district judge at Kendal Magistrates Court, found the companies not guilty. The action, under the Environmental Protection Act, was against Wind Prospect, which operates the site and Powergen Renewables which owns it. Making his ruling, Judge Peter Wallace at Kendal Magistrates' Court said he "had not been convinced" by the residents' case. 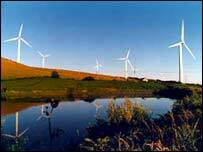 Opponents of the wind farms were disappointed when Barrow councillors decided to drop planned enforcement action in December 2002. Most of the turbines at Far Old Park Farm do not have planning permission. Instead, the council signed an agreement with the developer, imposing a range of planning conditions on the turbines already built.